I finally sat down and finished up my last two samples for my upcoming Christmas Card Stamp-A-Lot. I'll be sending out the newsletter with sign up information today. This class will be held on Friday, Nov. 28th from noon until 6 p.m. You will make 10 cards for $15 and you pick the cards you want to make. I'm taking reservations until Saturday, Nov. 22nd. 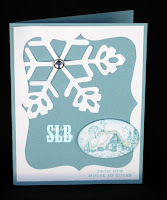 Here is a picture of all the cards that are available for you to do at the Christmas Card Stamp-A-Lot. When you register, you will need to tell me which cards you want to do and how many of each one. I've been hunting high and low for a card that would inspire me with the Just a Stretch set. I finally found one! Thanks for sharing and looks like you've got some great cards for your Stamp-a-lot!